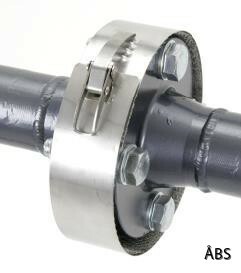 The flange guard FLANGEGUARD is made of AISi 316 material. This mesh, which is shrunk along the center to fill the gap between the two flange surfaces is critically important. It quickly and efficiently diffuses a leakage, which means that it does not build up a pressure and the leakage drains safely.